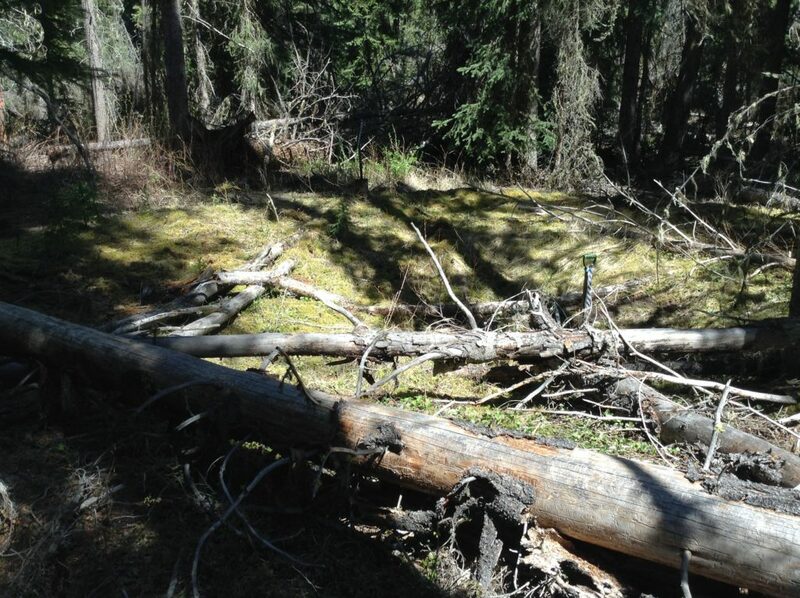 Fire and Archaeology – Circle CRM Group Inc.
During the summer of 2017, wildfires ravaged the interior of British Columbia, causing millions of dollars of devastation to personal property, infrastructure, livestock, natural habitats and resources. While nature has grown increasingly adapt at recovery, these hard hit ecozones will exhibit the scars from this impact for many years. We had opportunity to witness the impact first hand, and judge the effects that fire devastation can have on an archaeological resource. In the early spring, one of our crews identified a previously unknown archaeological resource comprised of several cultural depressions and a subsurface lithic component. During initial site identification and recording, the cultural depressions were visible through the leaf litter, blowdown and existing ground cover. 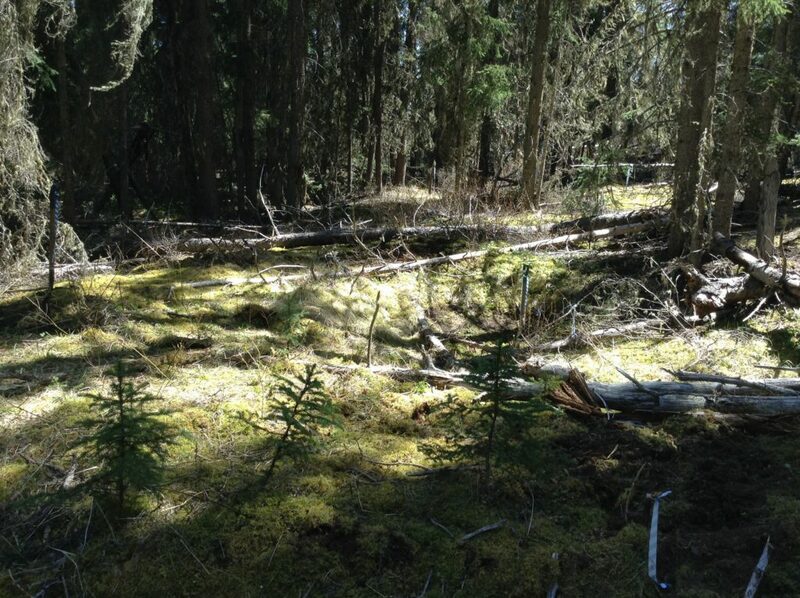 While visible, their distinctness was obscured by the understory of the mixed spruce and pine ecozone. Photographs of the site area attempted to demonstrate the size and relationship of the cultural depressions, however, the depressions are barely discernible, identifiable by shovel and flagging tape. A cultural depression, marked by shovel and flagging tape (can you see it?). More cultural depressions, before the fires that devastated the Cariboo-Chilcotin. 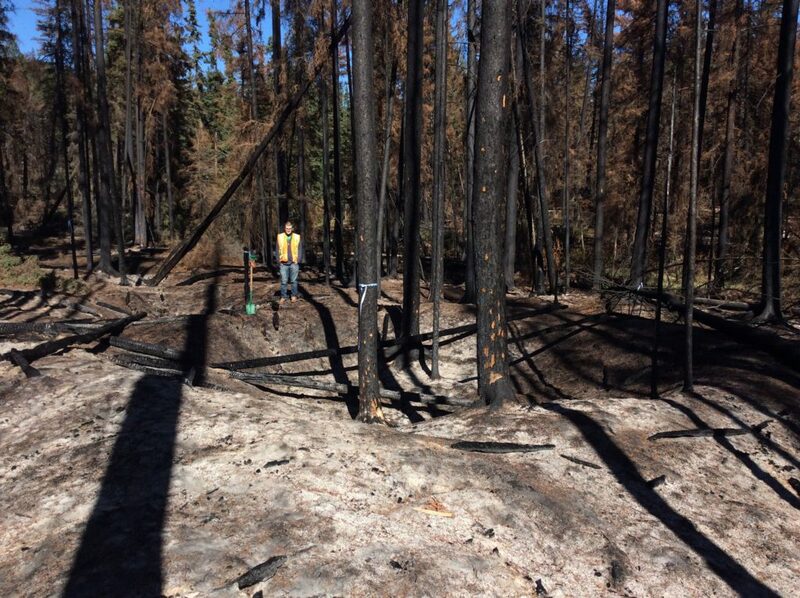 After the evacuations were lifted and backcountry areas were deemed safe to return to work, our crews made a return visit to the cultural depression site, to note the impact that the fire may have had. 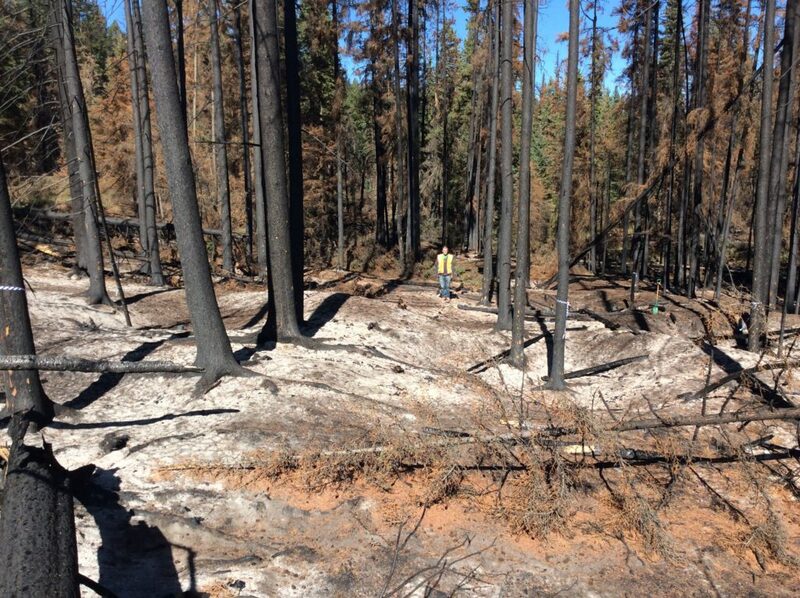 The site area had been hit hard by some of the most intense fire activity. The fire burned hot and fast, moving through the area quickly and unabated. The forest canopy and understory were completely removed, leaving only the blackened trunks of the hardy spruce and pine. The ground surface held a thin carpet of fine ash, overlain with a thick mat of fire-reddened pine and spruce needles. While this thick surface coverage would obscure any potential for identifying surface scatters of artifacts, the devastating impact of the fire had removed nearly all traces of the green ecozone, revealing in graphic detail the cultural depressions previously identified in the spring. A cultural depression after the fires; Duncan has been added for additional scale.